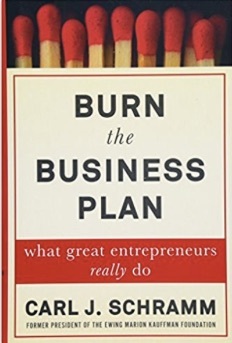 Burn the Business Plan: The title is arresting and has a lot of truth. I am a retired MBA teacher of new venture creation and many of my students produced business plans. For me though a business plan is not necessarily a 50pp document with as may pages of appendices. While Professor Schramm says they are just for venture capitalists and the poor souls who start businesses thinking that they’ll raise millions, actually some sort of plan is vital. It can be on a cocktail napkin, like Herb Kelleher’s plan for Southwest Airlines (which was just a triangle with Houston, Dallas and San Antonio at each apex). Some ventures can be stumbled into, but most sustainable startups need a sense of purpose and an intended direction. That will entail a plan, answering questions like: why will anyone want to buy, and if so, how will the business make money, how will the founder know how little money she needs and how will she track money in the bank + how long it will last. Burn the Business Plan is a book that intending entrepreneurs should read, however. They will learn why they will not be headed to an IPO—given the fact that less than one percent of startups get VC investment1, as well as why they should not aim to be. Readers will be able to check their own motivation for starting a company against some excellent advice and examples. However, budding founders will come to appreciate how much they can prepare themselves right where they are, especially in the companies they’ve worked for for the last few years. Readers of the Burn the Business Plan will save themselves a lot more time than it takes to read it, and may avoid pitifully obvious mistakes. You may want to take a look at Business Plan Mistakes and How to Avoid Them. Venture Founders has other helpful pages like the Business Model Planner, Business Plan Outline and the Business Model Canvas. Great entrepreneurs are not those who spend huge amounts of time agonizing over their business plans. Schramm is right. On the other hand, what great entrepreneurs do is to be very clear and articulate about why the venture will exist. They have a perfect commitment about the purpose of the new venture.